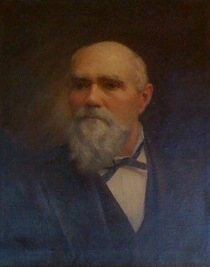 Born in New York in 1824, Orlando Simons arrived in Saint Paul in 1849 to practice law with his friend H.F. Masterson. Upon arriving, the two found that carpenters were in more demand than lawyers, and being skilled woodworkers, went into the carpentry business. Simons became a carpenter and Masterson worked at a sawmill at St. Anthony Falls. Simons was approached with a deal to construct a fort on the frontier that made the two enough money to found the first law firm in Minnesota (Masterson & Simons). Three years later he married Julia Fulwider; the couple had 13 children. Simons was elected as the first justice of the peace in Saint Paul after the town was organized in 1849. In 1859 he became the first magistrate of Saint Paul. The Honorable Orlando Simons was appointed associate judge in the Court of Common Pleas in 1875, and later that year was elected to the Second District bench. He was subsequently re-elected for 15 years, and died while in office in 1890. The Law Library has on display judicial portraits of past Second Judicial District Court judges, going back to 1857. If you have any information or commentary about Judge Simons, please leave a response or send us an e-mail. To view the portraits in person, visit us on the 18th floor of the Ramsey County Courthouse.